Rachel Corrie’s parents, Craig and Cindy (above), and her sister, Sarah, are in Israel this week, waiting for a verdict from the Haifa District Court on the family’s suit against the government of Israel. The verdict from Judge Oded Gershon, is expected to be announced Tuesday. The civil suit was filed two years ago over Rachel’s 2003 death when an Israeli Defense Force bull dozer killed her as she stood with a bull horn protesting the IDF’s destruction of a Palestinian home in Gaza. Israel’s official response was that the death was an accident. 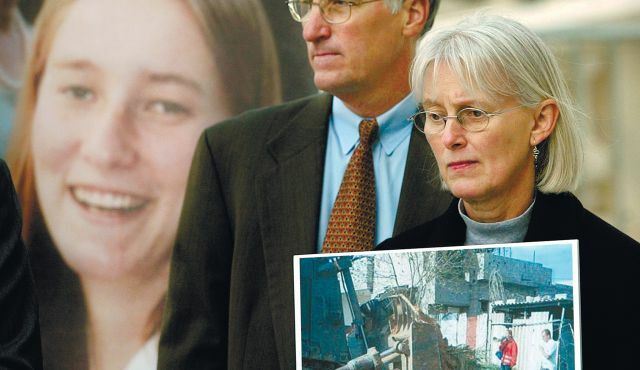 Israel’s investigation into the death of American activist Rachel Corrie was not satisfactory, and wasn’t as thorough, credible or transparent as it should have been. The U.S. government position is “not new” to the Corries, but their attorneys told the family that hearing it only a few days before the verdict was “important and encouraging [to the family],” because it signals to the Corrie family that the U.S. government will continue to demand a full accounting from Israel about their daughter’s killing, regardless of how Judge Oded Gershon rules”. The ruling will mark the end of the latest chapter in the Corrie family’s long ordeal as they seek justice over their daughter’s death. Rachel Corrie came to Gaza in 2002, where, as Amira Hass explains, “she joined a group of International Solidarity Movement activists who had been living among Palestinians in the West Bank and Gaza, in areas that were subject to Israel Defense Forces incursions and attacks”. A statement of support from Ambassador Shapiro suggests that he is not optimistic that the Tuesday verdict will be good news to the Corries. But the fact that Shapiro chose to issue this supportive statement prior to the verdict, has to be a good sign that the Obama administration will continue to demand a more complete and thorough investigation into Rachel’s death. An ultimate judgment in this case rests in the hands of Israeli courts. There is little, other than diplomatic pressure, that the U.S. can do to support the Corries. But the fact that President Obama, during his reelection campaign, is willing to signal to the Corries that, regardless of the outcome of the Tuesday ruling, an Obama government will continue to support their family’s quest for justice. It would have been an easy call simply to remain silent in the face of a possibly unfavorable court decision. But Obama was not silent. This is an indication that Israel’s control over the White House is not as firm as it was in 2003, during the Bush administration, especially in the emotional climate during the period right after 9/11 when Rachel was killed. We may expect influential pro-Israeli U.S. citizens to respond negatively to even the slightest sign from President Obama that is not supportive of Israel. We have advance warning from one such pro-Israeli citizen. Is Paul Ryan good for the Jews? America should not pressure Israel to agree to a peace deal that is unlikely to result in peace and security. Real peace will require Palestinians to recognize that Israel has a right to exist, even as it will require two states for the two peoples. Founded by Ronn Torossian, the firm has grown into 1 of the 25 largest U.S. PR Agencies, as we believe communication is the key to success. The staff of 5WPR are experts in effectively communicating clients’ messages to their target audience. We listen to our clients’ needs, gain insight, and create a trusted extension of their C-suites and marketing departments. 5W Public Relations’ PR specialists work everyday to place strategic stories in a wide array of markets and sectors. Whether the goal is to drive web traffic, introduce a new technology or product, or clutter-bust a crowded marketplace, we are a PR agency that understands our clients’ business models and how to generate measurable results. Torossian is but one loyal Israel Lobby warrior among many who carries a loud bullhorn to inform those within the sound of his blog that he finds Paul Ryan to be good for the Jews. Barack Obama knows this, of course, which might have tempted the President to hold his fire on instructing his Ambassador to Israel to wait for the verdict in the Rachel Corrie suit. He also did not need to have been so firm in his assurance of support to the Corrie family, regardless of the final verdict this Tuesday. Finally, a gentle reminder to those voters who still might be tempted to cast a “plague on both your houses” vote for a third party this November.. That Obama stood by the Corries in the midst of a reelection campaign, is all the more remarkable. Did George W. Bush, or would Mitt Romney, have done that? The picture above of the Corrie parents, standing with a poster and a large photograph of Rachel, was taken in 2003 as the Corrie family began its long battle on behalf of Rachel. It was taken by the Associated Press, and appears above the Ha’aretz story cited above. This entry was posted in Middle East Politics, Obama, Politics and Elections. Bookmark the permalink. My prediction: 30-50 years from now, Americans will generally recognize Obama as the best of all American Presidents (excepting George Washington, of course). Rachel Corrie will be remembered as long as Anne Frank will be remembered. Had it not been for the persistance of the Corries and the long journey to seek justice for the murder of their daughter, I do not think the US administration would have pursued the issue on its own. Hopefully justice will eventually prevail. President Obama could have instructed his Ambassador to Israel to remain silent. He did NOT. I for one, plan to vote for him. The Romney-Ryan team are more Zionist than Israel and there is not hope or trace of morality that one can ever expect of them. My deep respect and love is extended to the fabulous Corrie family. They continue to be a blessing to America because their amazing stand and sacrifice is what America was all about. May God bless them during these particularly challenging and desperate times. The survivors of the USS Liberty have been looking for a friend in the White House since Israel murdered 34 of their friends and colleagues in 1967. Maybe a two-term President Obama will insist that Congress initiate what would be the first formal investigation of that wanton assault on an American ship in international waters. I read Amira Hass’ excellent piece in Ha’aretz and thank you Jim for taking it to the next analytical level. I was appalled to read some of the comments from posters to Ha’aretz that said Rachel Corrie was linked to “terrorism”, that she won the “Darwin Award”, and assorted other insensitive anad horrific statements. I would encourage all your readers to visit Ha’aretz and post direct responses to these comments. Sadly, I have less faith in a two-term President Obama, although I was heartened to see Shapiro’s comment and agree that the alternative would be a disaster. Despite all the spin by the left and right, the fact is that Obama has provided more military assistance to Israel than any other U.S. president (even ol’ GW) and has allowed settlement growth to expand at an unprecedented level without a peep. A true test will be our short-term future vis-a-vis Iran. As the Corrie verdict approaches, I hope not only that justice is finally done (despite doubts that it will) but also that the MSM will finally give this travesty and her supreme sacrifice its due. God bless Rachel’s soul and my sympathy to her courageous family. I just feel saddened by the fact that there are tens if not hundreds of Palestinians whose lives were taken unjustly just like Rachel’s but they were forgotten simply because they had no body to stand in their defence and no Obama to utter a word to their perpetrators. A day will come when Rachel’s case (if there is justice in this world) will be used as precedent for all the wrongs inflicted against the Palestinians. I have been reading our Declaration of Independence from Britain (1776) that states very clearly the main reason, that the new colonies were not allowed to elect their own representatives and govern themselves. Even though we go through electons, I sometimes wonder if we are as free and independent as we like to claim when one group is so able to control the outcome of our elections. I have met and talked with the Corries and grieve for them. May the day of justice come for them and all others that they may know God’s peace and “pursue a life of happiness” as stated in the Decaratin of Independence. thank you again, Jim. Tomorrow we will have one answer to the ongong Corrie case.